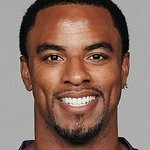 NFL player Darren Sharper is a safety for the New Orleans Saints. Darren has partnered with teammate Roman Harper to host a number of events and projects, including the Sharper and Harper Football Camp. Harper and Sharper have supported several of the United Way's projects, hosting Game Night After Party and creating a PSA asking people to give to the United Way’s Gulf Cost Recovery Fund, and encouraging their teammates to get involved in “Hope for the Holidays”, which helped rehome families affected by Hurricane Katrina. Google trends for "Darren Sharper"
We don't have any news stories about Darren Sharper.